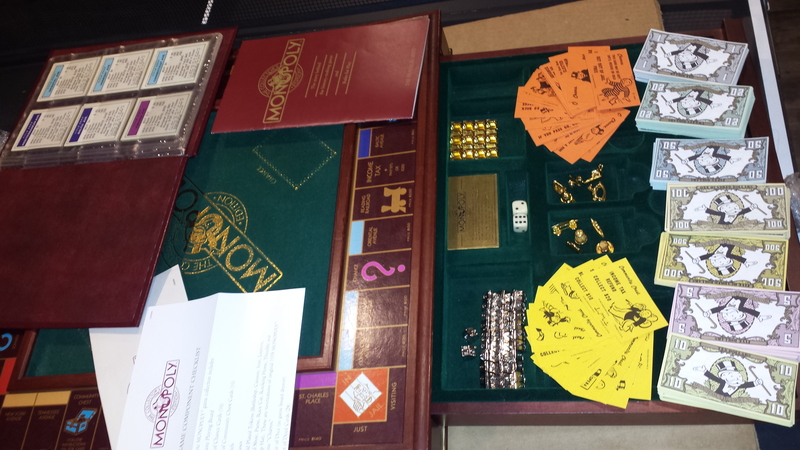 Complete set from Franklin Mint. Limited edition. 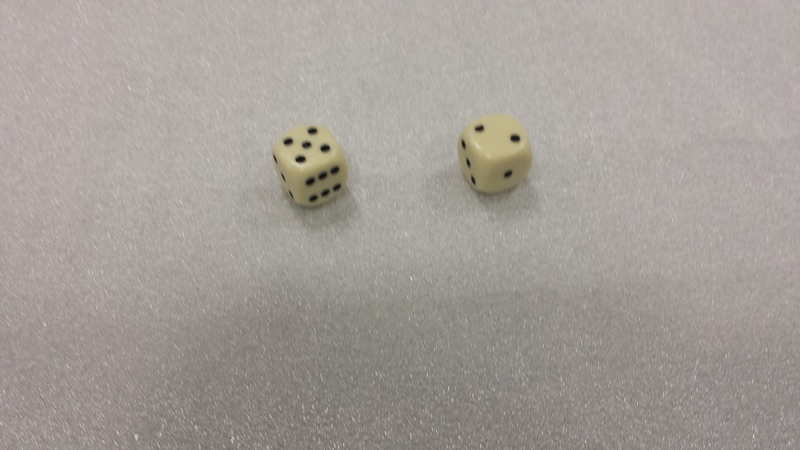 Produced in 1982 and limited to 2,500 sets. It was priced of over $2000 back in 1982. Displayed. Signs of wear. Sale price reflects the condition! 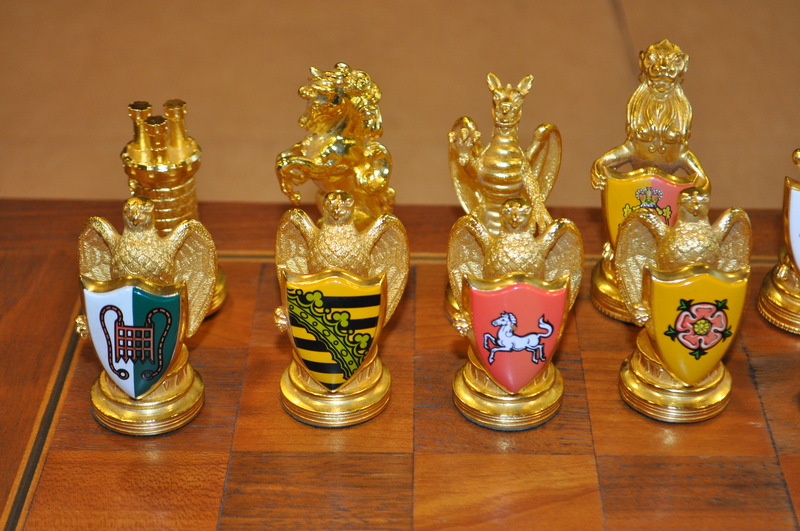 Individual pieces are offered for sale. Please contact me if you’d like to make special arrangements. 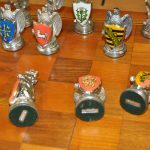 Hard to find complete set. Condition – board very good, some minor wear, scuffs. Could be further cleaned up (drawers) and polished. 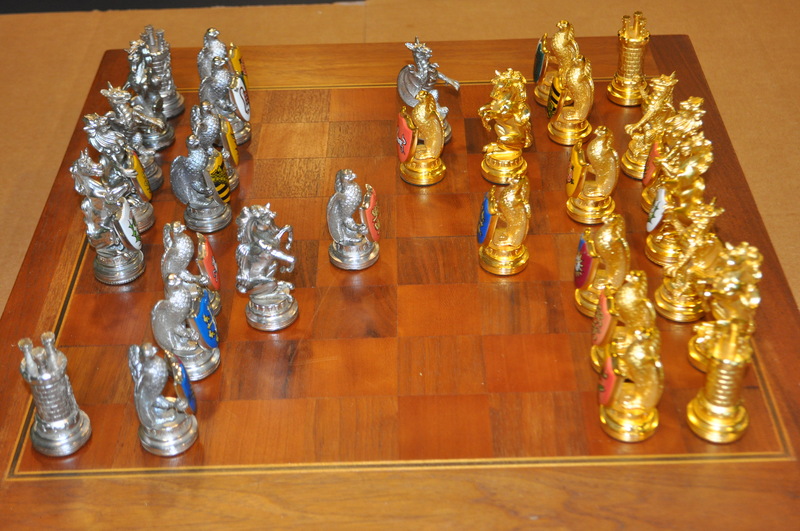 Gold Plated piece – great, no obvious tarnishing, 1-2 Pawn shields may have a minimal dots (loss of paint). 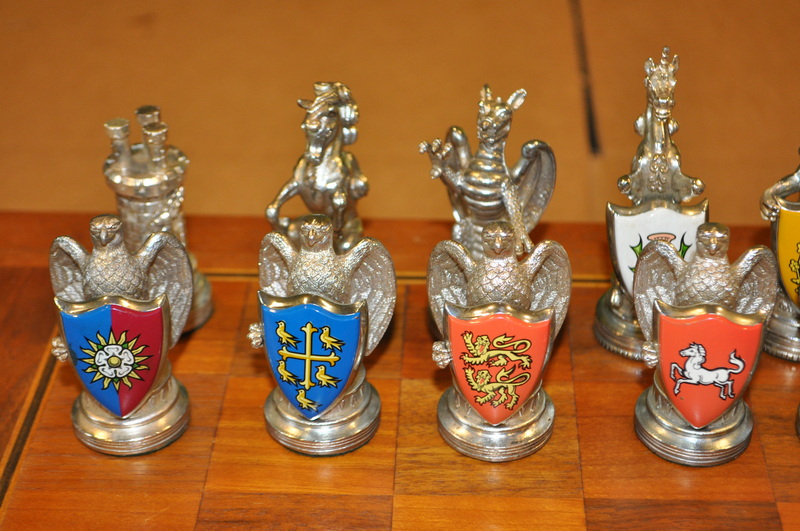 Silver Plated piece – several have tarnishing – need to be polished. 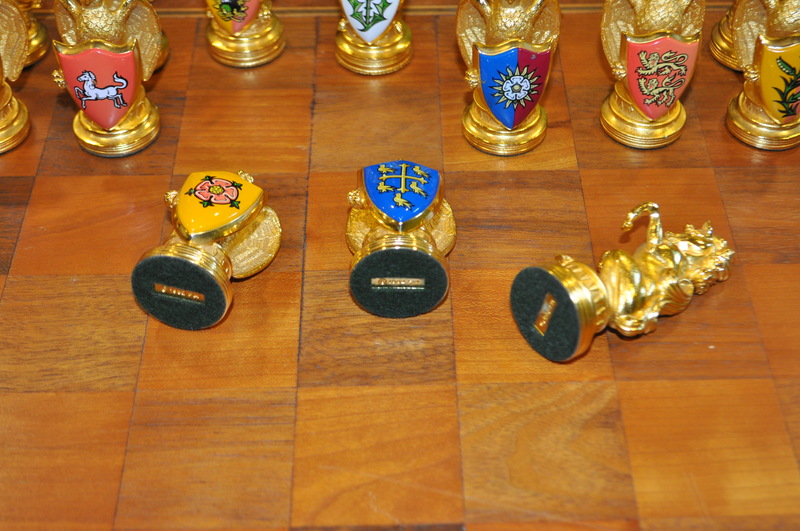 Several pawns shields have small loss of paint. Sale price reflects the condition! 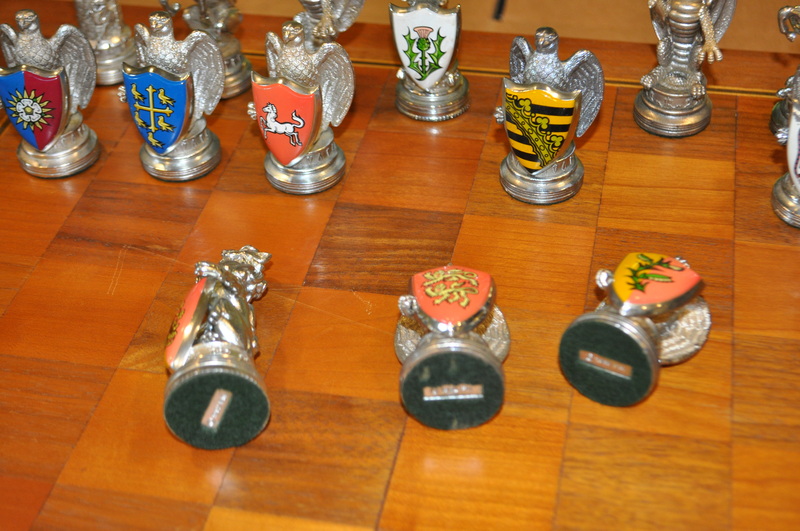 Individual pieces are offered for sale. Many available. 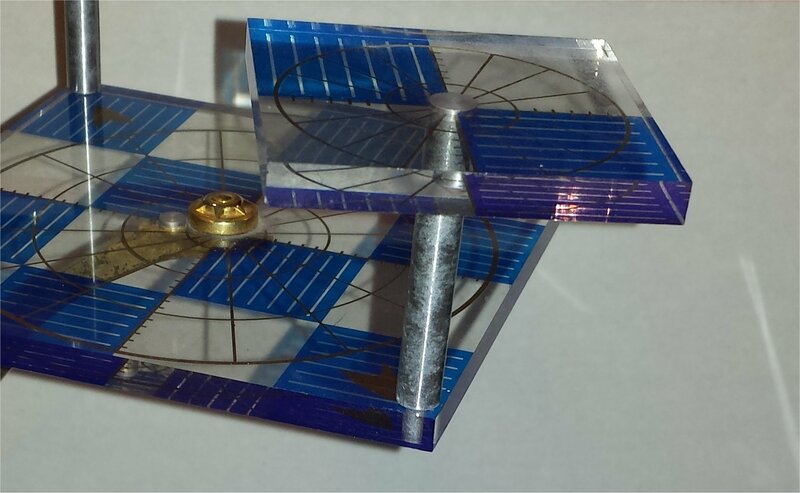 I have a number of new/like new spare pieces available at a cost of $85-$135 (includes original styrofoam box) and used pieces with some wear at a cost of $45-$115. Please contact me if you’d like to make special arrangements. Very Heavy. Shipping with insurance, tracking and delivery confirmation is included. No returns or refunds. 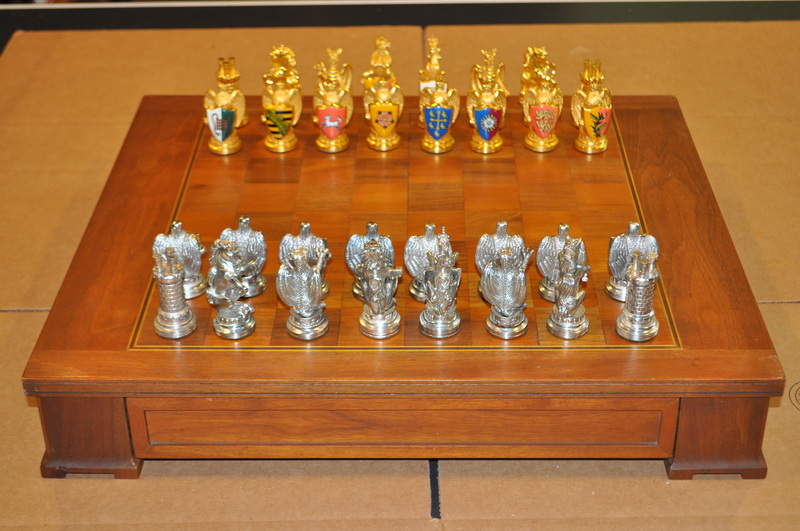 This is a limited edition Franklin Mint Chess Set in mint condition. 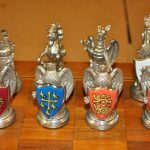 This is the Royal Houses of Britain Heraldic Chess Set made by Franklin Mint in 1982 – it was available exclusively by private invitation and limited to 2500 sets. 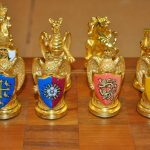 Each set of sculptured playing pieces was cast in pure silver electroplated on pewter and in pure 24 carat gold electroplated on pewter and emblazoned with brilliant enamel colors representing with complete heraldic authenticity the kingdoms and royal dynasties of the British monarchy. 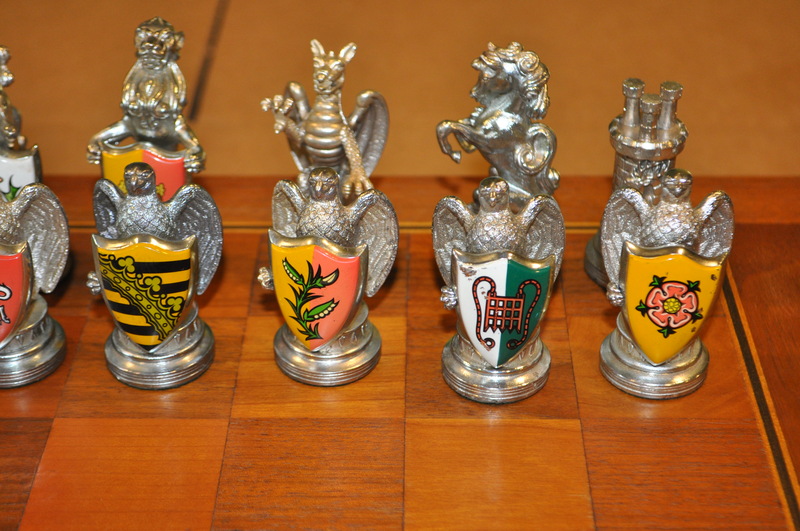 This regal Chess Set was issued in consultation with England’s ultimate heraldic authority, the College of Arms, London and designed by Robert Parsons, an official artist of the College of Arms, who is internationally known for his work in the field of heraldry. 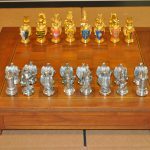 The Trustees of the College of Arms appointed The Franklin Mint to produce this magnificent chess set. 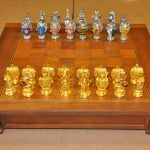 This complete 32 piece set includes the original playing board which was specially designed and inlaid with fine hardwood and deep-polished to provide a rich dark background tone for the chess pieces. 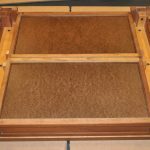 Board measurements: 22″x 19 ” x 3 “. 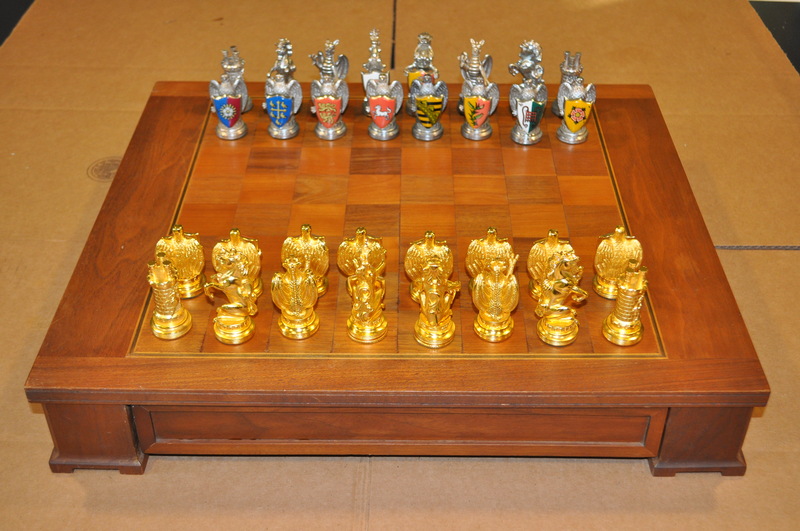 Contains two drawers for storage of the chess pieces. 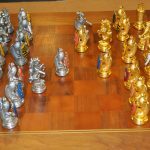 Each playing piece is beautifully detailed on all sides and are heavy solid pieces measuring 3-4” tall each and approximately 6-7 oz. 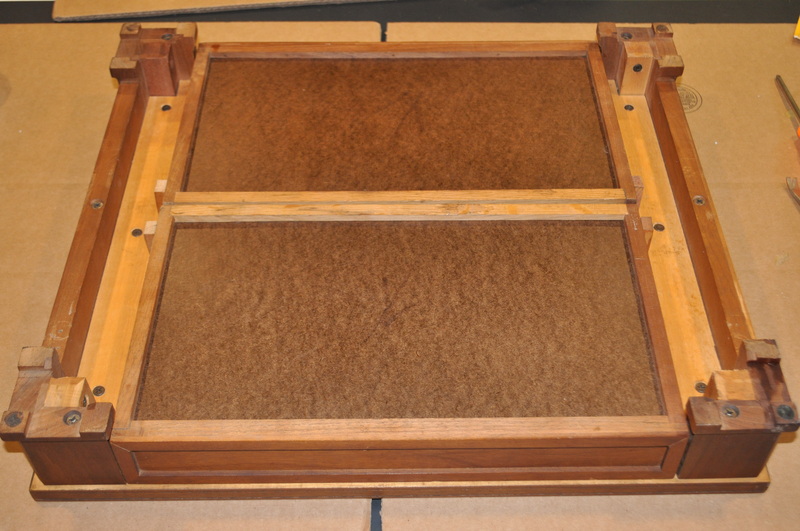 each with felt padding to protect both the piece itself and the playing board. 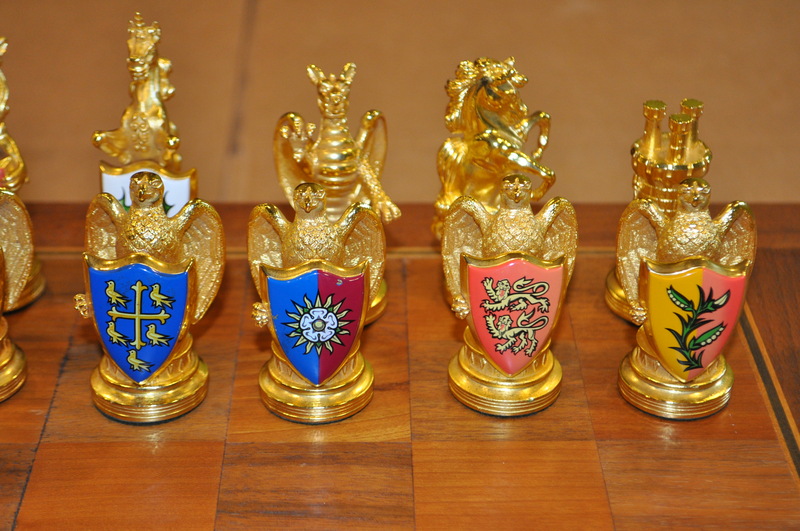 Note the curled furl on the tail on the back of the horses, the spectacular dragons, regal lions and magnificent eagles. The castles are detailed with a stag running past the entry! This is an extremely hard to find set – nothing like this is available today. 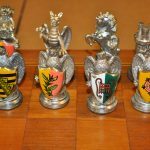 This set creates an impressive display but this set has been thoughtfully designed for actual use as well as for display. 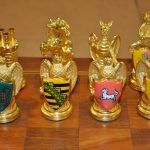 The pieces are carefully sculptured, sized and scaled so that each one clearly fits the function assigned to it in the game of chess. 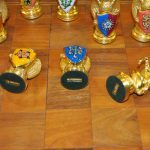 The collector’s chessboard has been sized and scaled with equal care. Sold in 1982 for over $2,000! !